Lancaster County Mud Sales – A Local Tradition & Good Clean Fun! For the last three days in Lancaster County (aka – an eternity! ), it’s been raining cats and dogs… BUT, this weekend they’re predicting 80 degree, sunny weather… which got me thinking about… MUD SALES! This weekend is going to be just perfect for the Robert Fulton Fire Company Sale. A “Mud Sale” is the Lancaster County term for an annual auction/sale at one of a number of local fire companies. The sales are typically held in farmers fields, and are appropriately named for the condition of the thawing (or rain soaked!) ground. They attract thousands of people looking for bargains on anything from Amish quilts and antiques to lumber, buggies and lawn equipment. There are usually a large number of Amish who attend these sales.Most sales begin at 8:30 a.m. sharp, but activities continue throughout the day for those who wish to catch a glimpse of some local color and enjoy sampling traditional Lancaster County farm fare. Crafts, plants, tools, antiques, farm equipment, furniture, food, buggies, wagons, groceries, horses. Quilts, crafts, horses, lumber & building supplies, shrubbery, miscellaneous items and lots of homemade food. Quilts, horses, crafts, building materials, lawn equipment, new and used furniture. Antiques, harness and tack, specialty items, quilts, crafts, carriages, buggies, wagons and food. Hardware, shop tools, plants, furniture, antiques, crafts, hay and straw, quilts, horses, food and more. Plants, groceries, antiques, furniture, lumber, tack, sheds and gazebos, equipment, buggies, quilts, horses. Whether you make it out this weekend, or for one of the later events, you won’t be disappointed by the atmosphere or the items up for sale. And if you’re lucky, it won’t actually be muddy! 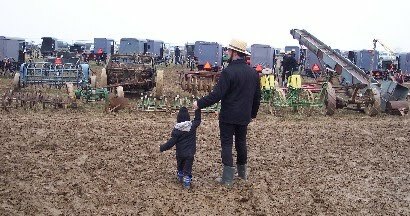 Mud Sales in Lancaster County: Fun Tradition for a Worthy Cause – and a Sign That Springtime is Near! Visit the Smithton for Lancaster County’s Best Kept Secrets Tour — Tour de Ephrata is Coming Up Fast!